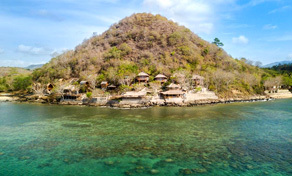 Gili Gede is the most popular island from “The Secret Gilis” which is composed of small islands in the north of Lombok coast. Its isolated location makes it a perfect escape from the bustling and touristic cities to have some peace and quiet. 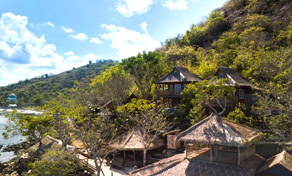 It is ideal whether for some quality alone time, or to enjoy the island with your partner, or in a group. There are many reasons to visit this sumptuous island, one of them is the experience to have a beach just for yourself but this comes with some facts that you should be aware of. First of all, there is no restaurants in Gili Gede so you must eat in the hotel where you are staying, second of all, there is no ATMs, so make sure to bring enough cash. Remember that this is a Muslim island and for that reason you must dress conservatively when you are walking around the town and alcoholic drinks are forbidden in shops and some restaurants, so if you are expecting to have some crazy nightlife Gili Gede is not the place for that. 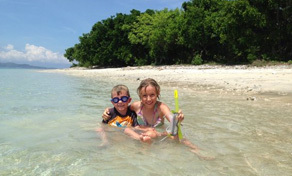 Being surrounded by beautiful coasts is the perfect place to enjoy some strolls, relax in the sandy beaches, fishing, or joining to water activities like surfing, snorkelling, and scuba diving which is the favorite of travellers; and it includes a boat which takes you to the best nearby reefs such as Gili Layan and Gili Ringgit to swim and watch colourful fish, at the same time you can explore the islands or the fishing docks. Plan this activity at your hotel; with a fare of around 400.000 rupiahs, which includes scuba equipment and a lunch on the beach. It is a paradise for those who love surfing. 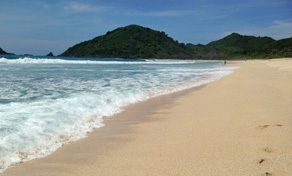 This untouched beach is located in the south of Pelangan and it can be reached by a car or motorbike. Its large waves make this place a perfect destination for surfers, yet, ideal to sunbathe or just relax and watch the sunset. There, the area is undeveloped so you won't find any restaurants, thus, it is necessary to bring your own water and food. Not many travelers come here so you will feel that it is a private beach that was made just for you. The island is 4 km long and there is no taxi or public transportation in the zone so one of your options is to walk which will give you the opportunity to talk with the friendly residents. There is a motorbike company where you can rent one, however, the distances in the island are walkable so it won't be too necessary, also you can arrange a boat from your hotel or with a fisherman to take you to any of the close beaches.